Journey through ancient lands for one of the greatest mysteries of all time. "Atlantis Quest is the first game I ever got hooked on. Many, many years ago when it first came out, I played for hours every day. All these years later, I am still hooked on playing Match 3 games. Simple, but challenging. Also, save your tools -- you'll need them for the last 3 levels!" Are you ready for an exciting quest of adventure and discovery? Embark on a journey around ancient Greece, Babylon, Carthage, Egypt and Rome in the search for one of the greatest mysteries of all time - the lost city of Atlantis. 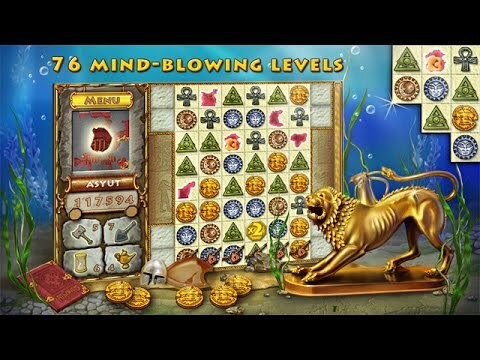 In this classic style matching game with a dazzling new twist, you will need to discover pieces of ancient artifacts that will help you find a way to your destination. A great storyline with extremely addictive new gameplay, 76 explosive levels, exciting power-up items and numerous extra features will keep you playing for days on end.